the company to redeem most of the Fed’s $26 billion in preferred interests. That money will come from the unused portion of an emergency assistance package that the Treasury made available to A.I.G. as its troubles reached a peak in early 2009. OK. So AIG is going to pay back $20 billion by selling off some assets, but the other $26 billion comes from tapping into unused parts of the existing Treasury rescue package. 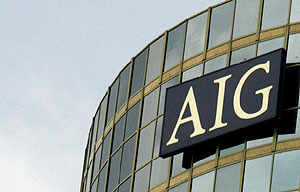 So now AIG will owe the Treasury even more. How is that going to be paid off? The Treasury will come out of the transaction with a larger preferred stake in A.I.G….Once the Fed has been fully repaid, the agreement calls for A.I.G. to exchange all of the Treasury’s preferred shares for 1.65 billion shares of common stock….When the exchange from preferred to common has been done, the Treasury will be able to sell its common shares on the public markets, something it is expected to do gradually over time. This might work! Then again, when the government starts selling off billions of shares of AIG stock, whether slowly or not, it might not. Only time will tell. Basically, though, the Treasury now owns 92% of AIG, and taxpayers will get paid back only if and when it sells that stake. Once this deal is complete I think Treasury will be on the hook for about $50 billion or so in outstanding loans to AIG, so if AIG’s share price holds up at around 40 bucks while Treasury’s shares are dribbled out to the market, we the taxpayers will end up in decent shape on the whole deal.